The affectionate term "Holy Mother" refers to Sarada Devi (1853-1920), Ramakrishna's wife and spiritual counterpart. According to the custom then prevalent in India, she was betrothed to him while still a child. At the age of 18, she left her parental home Jayrambati to join her husband, who lived at Dakshineswar, some sixty miles away, near Calcutta. 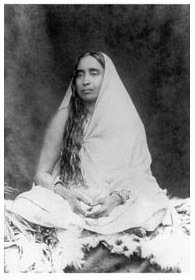 Sarada Devi was a spiritual and intellectual leader in her own right. She served Ramakrishna and his disciples for many years. After Ramakrishna's passing away, she carried on his religious ministry, serving as guide and inspiration of the new spiritual movement. Don't be afraid. Human birth is full of suffering and one has to endure everything patiently, taking the name of God. None, not even God in human form, can escape the sufferings of body and mind. To err is human. One must not take that into account. It is harmful for oneself. One gets into the habit of finding fault. To make mistakes is man's very nature; but few of those who criticize know how to correct them. Let me tell you how to love all equally," said Mother. "Do not demand anything from those you love. If you make demands, some will give you more and some less. In any case you will love more those who give you more and less those who give you less. Thus your love will not be the same for all. You will not be able to love all impartially. After someone finished her sweeping and threw the broom into a corner, Mother said, "How strange, my dear! The work is finished, and you throw it away carelessly. It takes almost the same time to put it away slowly and carefully as to throw it away. Should you despise a thing just because it is insignificant? 'Him that you save, saves you in turn.' Won't you need it again? Besides, this thing too forms a part of our household. From that point of view also it deserves some consideration. You must give each one his due share of honour. Even a broom must be shown some honour. The smallest work must be done with reverence.